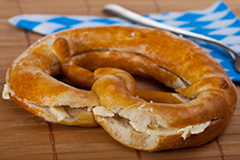 The ideal pretzel, as served in Germany, has a dark brown, crispy, salty crust, and inside a soft dough. It has a plump "body", and thin, crispy (not dry) crossed "arms." The pretzel is traditionally made from white (wheat) flour, malt, salt, yeast, and water. 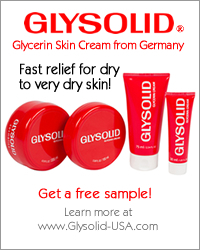 In some regions in Germany, fat is added to the dough to soften it. Other variations use whole wheat flour, spelt flour, or a mixture of different flours. Pretzels are topped with coarse salt or sometimes with sesame seeds, sunflower seeds, or poppy seeds. Before baking, the formed pretzel is dunked briefly in a mixture of sodium hydroxide and water. In German this mixture is called Natronlauge. This is what gives the pretzel its unique color and flavor. 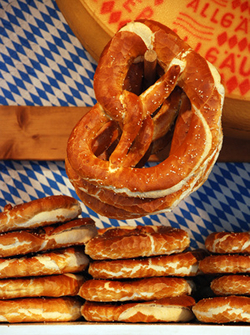 Because of this technique, this type of pretzel is also called a Laugenbrezel. Although other regions of Germany have their stories of how it was invented, the Laugenbrezel is accredited to the Bavarians. The saga goes that on the morning of February 11, 1839, Anton Nepomuk Pfanenbrenner, the baker for the Munich Royal Café, was preparing some sweet pretzels for his guests. He wanted to brush the pretzels with sugar-water, but accidentally used the Natronlauge, the sodium hydroxide solution being used to clean and disinfect the bakery countertops. The baker decided to bake the pretzels anyway. The pretzels came out of the oven with a unique brown crust, soft center, and delicious taste. His guests were very pleased and he became the "pretzel hero." There are many theories surrounding the creation of the pretzel shape. Some say the shape originates with the Romans, resembling the Roman ring-bread, a small, circular-shaped bread. Others say the shape originated in a monastery, where the pretzel shape was designed to resemble a praying monk (back then the praying position was arms crossed with the hands on the shoulders). There are slight variations of the pretzel shape in each region of Germany. 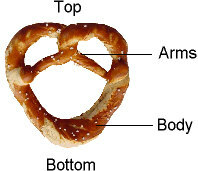 For example, in Bavaria, the arms are shorter and attached closer to the top (thin part) of the pretzel. In Swabian the arms of the pretzel sit very low on the body. Pretzels today continue to be formed by hand as has been done throughout history. Bakers spend years perfecting the pretzel-forming technique. First, the dough needs to be rolled out. Both ends of the strand are held up, and through a quick swing, the center of the strand is twisted. The ends are then pressed onto the body of the pretzel. This process, when prefected, takes only seconds, but it needs a lot of practice to get it right. Laugengebäck refers to baked items that are made with the same dough and technique as the Laugenbrezel, but are either formed differently or have added toppings. Some common ones are identified below. Pretzel rolls (Laugenbrötchen) are formed into small round balls. Recently, these have grown in popularity here in the U.S.. They are becoming more available at bakeries and markets. The Cheese Pretzel is a Laugenbrezel with a cheese topping. The cheese is added during the last few minutes of baking so that it doesn't melt into the dough, but rather form a crisp coating on the pretzel. Delicious! The Laugenstange is formed into an elongated roll. Variations include Cheese Sticks (Käsestangen), which have a cheese topping, and Ham & Cheese Sticks (Käse-Schinken-Stangen), which have a ham and cheese topping. In Baden and Schwaben on New Year's Day, pretzels are made without the use of sodium hydroxide solution (Natronlauge). Instead, the pretzels are made with either a milk-dough or with a sweet yeast dough. They are said to represent luck and well-being. The custom is that children pick up their new year's pretzel (Neujahrsbrezel), along with a coin for their savings, at their grandparent's house. Bakeries in Germany also sell sweet pretzels. For example, the Nut-Pretzel (Nussbrezel) is made from puff-pastry and is crispy and flakey. During Oktoberfest in Munich, also called Wiesnzeit in German, a much larger pretzel is baked. The crust is light brown (compared to the dark brown crust of the Laugen Pretzel), and the texture of the bread is more like a soft, white bread. This pretzel is called the Wiesnbrezn. In southwestern Germany, the tradition is to bake the special Lent Pretzel (Fastenbrezeln) during the 40 days of Lent. These pretzels are very light in color. The baker cooks the dough briefly in water before baking them. After baking, the pretzels are sprinkled with salt. The castle "Burg an der Wupper," located near the city of Solingen, is famous for the Burger Brezel. The taste and texture of these pretzels are similar to very crispy toast. Local bakers keep the recipe of this pretzel a secret. What is the top and bottom of the pretzel? The top of the pretzel is the thin part, where the arms are twisted. The bottom is the thick part, as shown below. Doesn't the use of sodium hydroxide solution (Natronlauge) make the pretzels dangerous? The sodium hydroxide solution used in preparing the pretzels is dangerous, but the baked pretzel is not. During baking, the chemicals on the pretzel react with the carbon-dioxide in the air and is converted to baking soda. Natron is a salt and is fully edible. An alternative to the sodium hydroxide solution is a baking soda solution (1 tablespoon baking soda, 1 tablespoon salt, and 4 cups water). What is a Butter Pretzel (Butterbrezel)? The Butter Pretzel is a southern German favorite. This is a pretzel sliced in half. Both halfves are smeared with butter, then put back together to form a "butter sandwich."